Ironclad Integrity Ltd revealed via http://www.FindMyPrice.net the latest deals for Samsung’s most expensive TV, the 820TSn-2 Touch Screen LCD Display. Find My Price has become popular due to the accurate product descriptions and recommendations they make for their readers. The company is usually more interested in affordable products and hot deals, but this time, reviewers wanted to publish an article for their high-end consumers. Thus, they have tested and observed the performance of one of the most expensive TV sets in the world, namely, the 82-inch touchscreen system manufactured by Samsung. According to reviewers at http://www.FindMyPrice.net, there are some technical aspects that might determine buyers to purchase this model; however, none of them truly justifies the $60K price that the manufacturer has set for this system. The only noticeable difference between this LCD TV and the others is the fact that the screen has a diagonal of 82 inches and the display has been provided with the HD and touchscreen technology. The picture quality is very good, but controlling the screen through touch gestures could be difficult as a result of its large dimensions. The installation of the TV system cannot be performed without the help of a professional team. The dimensions of the device are 82.5 x 58.6 x 24.3 inches, whereas the weight amounts to 308 pounds. Despite this, analysts estimate that people who will choose this model will not be disappointed by its performance once they manage to install it in their homes. The device is not appropriate for small rooms, so reviewers do not recommend people to purchase it if they do not have enough space. 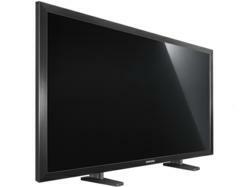 The LCD touchscreen is not the only advantage that the TV set features. It has a 2000:1 contrast ratio, so images are vividly colored, whereas the black sequences are rendered as dark as possible due to the good black level performance. In addition, viewers will enjoy the same good picture quality irrespective of their viewing angle. The interface of the television system is equally intelligent; in fact, the TV box features Microsoft’s Windows XP OS, so there are many tasks which can be performed with the help of this device besides watching movies and TV shows. Find My Price recommended this product to consumers, who can afford it. Reviewers concluded the product description with a list of deals and offers available at online retailers.